Dev Managers, take note: Ongoing learning and professional growth is so important to developers that they would take a job with development opportunities over a job with higher pay. Managers should incentivize their developers with training because developers today are frequently recruited and open to changing jobs, even if they’re happy in their current job. 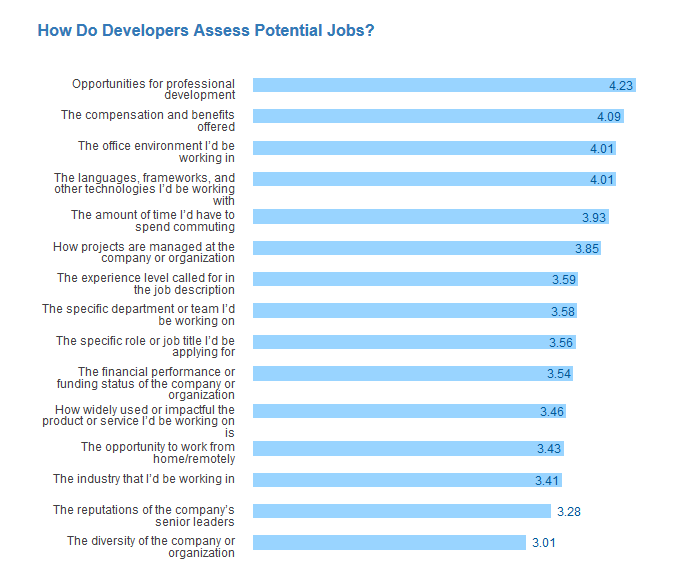 A survey by Stack Overflow of 64,000 developers reveals critical insights for Dev Managers. Like 53% of developers report higher job satisfaction working remotely, 75% code as a hobby, 56% would consider themselves underpaid, and 20% want to learn how to work on the Android platform. And the stereotypical image of a loner developer coding alone in his mom’s basement doesn’t match. There’s more diversity in the field than ever before, including more women working as developers.